Mississippi’s own Taylor McNair was named Miss Rodeo America 2019 this past December and has since been enthusiastically representing the Magnolia State as she makes appearances at rodeos, schools and other special events all across the country. The 23-year-old from Learned, who held the title of Miss Rodeo Mississippi in 2018, is using this opportunity to both promote and share Mississippi’s rich agriculture industry and lifestyle with others. 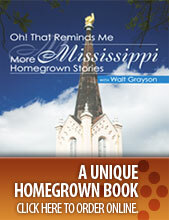 How did growing up on a rural Mississippi farm shape the person you are today? I grew up on my family’s row crop and cattle farm in the small town of Learned. My dad farms corn and soybeans and has over 100 head of cattle in the herd. Growing up in this environment helped to shape me into who I am today by learning the importance of responsibility, stewardship and how to work together. My sister and I put up and sold wheat straw for many years to have money to go towards our college fund as well as selling calves off of cows that we raised. These are the types of experiences that growing up on a farm afforded me to learn about the agriculture industry as well as myself. When and how did you become interested in competing in rodeos? I began riding in Little Britches rodeos at the age of three. I participated in rodeos until my beloved horse, Patches, passed away, and I wanted to take a break for a little while. When I was 13, I started back riding and wanted to get back to competing. Over the years, I have competed in barrels, poles, stake race, goat tying and break away roping. Are there valuable life lessons you’ve learned from the sport of rodeo? One of the most valuable lessons that I have learned from rodeoing is to never give up and go after the goals you’ve set with all that you can. There were many times I would not have a good run at a rodeo and would be disappointed, but that made me want to try even harder next time and keep working until I reached the goals that I set. 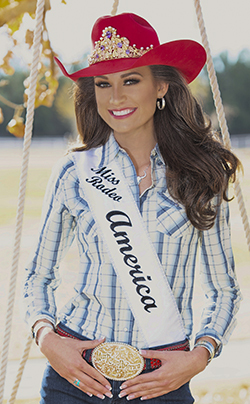 How would you describe the moment you were named and crowned Miss Rodeo America? When I was standing on the stage, and the moment that they announced I was the 2019 Miss Rodeo America, it was the most surreal and exciting moment of my life. I was nervous, excited, surprised and ecstatic all at the same time! There were so many amazing young women on that stage with me, and I am so grateful for this experience. Are you able to use your national platform to shine a spotlight on Mississippi’s rich agriculture industry? I am a proud Mississippian through and through, and I do feel that with having this national title that I am able to share more about the agricultural roots that I come from as well as the great State of Mississippi. Having earned a Bachelor of Science degree in Agriculture Business from Mississippi State University and with plans to attend the University of Mississippi School of Law and pursue a Master of Law in Agriculture and Food Law, what is your ultimate career goal? I thoroughly enjoy the policy side of agriculture. I feel like there are really exciting opportunities to help Mississippi farmers and communities through lobbying for their best interest and what they need to produce the highest quality of food and fiber to feed and clothe the world.